​Less than 16 days after the last closure, the A77 has once more been closed to all traffic for up to 12 hours, resulting in a 75-minute detour for traffic using Stena Line’s Loch Ryan Port. 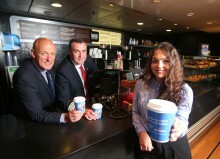 ​Stena Line’s parent company has confirmed a multi-million pound investment package to acquire the Superfast VII and Superfast VIII ferries which operate on its Cairnryan – Belfast route. ​Hundreds of Mini cars and their owners descended on Stena Line recently as they made their way to Ireland via Holyhead, Fishguard, Liverpool and Cairnryan to attend the International Mini Meeting which runs from May 25 – 29 in Westport, County Mayo. FANCY A FREE TRIP TO BRITAIN? Fancy a free trip to Ireland? ​Ferry company Stena Line is giving customers the chance to bring a friend for free From April 1st, anyone who books a new economy, flexi or premium motorist fare to Ireland on the Cairnryan – Belfast and Liverpool - Belfast routes, with leading ferry company Stena Line, gets to bring a friend for free! ​They say a fiver doesn’t take you far these days! Well ferry company Stena Line disagrees! Their brand new Fiver Fever fare will take you across the Irish Sea, to Northern Ireland, for a fun adventure that won’t break the bank - but be quick as you only have three days to bag a bargain! ​Stena Line is spreading the love this February by giving everyone who books a flexi and premium motorist fare up to 15% off their travel when booked by February 28. 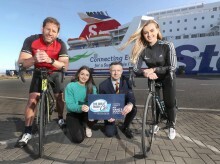 ​Superfast VII named top ship in Stena Line fleet LEADING ferry company Stena Line has named Stena Superfast VII, which services the Belfast-Cairnryan route, as the top ship according to the internal customer satisfaction tracking system Scandinfo. ​THE latest research from ABTA shows that 29% of people are planning to take a winter holiday this year and with bookings up 16% on last year, it’s no wonder that leading ferry company Stena Line has high hopes for its brand new day trip to Snow Factor at intu Braehead which is the UK’s longest indoor real snow slope. ​Stena Line has posted an impressive 6.5% year on year increase in the number of cars it carried across the Irish Sea in the month of July. ​‘Dogs need a holiday too’ says Stena Line! According to a recent Post Office survey, 1.4 million Britons will holiday in the UK this year instead of going abroad because the most important member of the family says so…the dog! ​This summer, popular singers from Northern Ireland will kick off the first ever Stena Line Sessions, a series of unique musical events that will showcase the best signing talent in the country, whilst you sail across the Irish Sea onboard Stena Line.